As compared to other vegetables you grow in your garden, growing asparagus requires a little more effort from the home gardener. This vegetable has specific soil, watering and fertilizing requirements. Asparagus can be started either from seeds or from crowns. If you start them off using seeds, the germination process will take about three weeks and the harvest two years after that. Starting from crowns are easier. Harvest can be expected as early as the first year after planting crowns. The number one enemy of asparagus as they grow are weeds. These unwanted greens compete with asparagus for nutrients so pull weeds out whenever you see them growing. Mulch the soil with compost every year (about two to three inches) but make sure not to cover the tips with soil. Asparagus has a delicate root system so if possible avoid tilling and disturbing the ground around the asparagus. If there’s one thing asparagus can’t go without, it’s water. To harvest succulent spears, adequate water is needed. If the soil is allowed to go dry, the spears would become stringy and wooden. 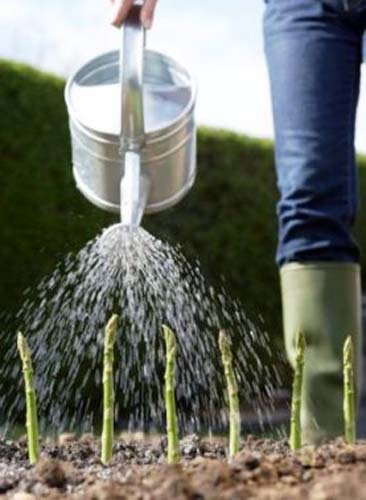 It is important to provide at least an inch of water every week during the first two years of an asparagus’ life. The soil must be moist all the time before and even after harvest but more so when you see the spears are already beginning to form. You can only reduce their water supply on the fourth year cutting it down to once every two weeks. Make sure however that the water can penetrate the soil to at least four feet deep. One of the keys to a successful asparagus harvest is the nutrients the soil has. When there aren’t enough nutrients in the soil, your asparagus will most likely be stunted and your yield greatly reduced. Thus, it is important to fertilize the soil. What is a good fertilizer? Asparagus would be happy with nitrogen-feeding two times a year. Regular application of a fertilizer that is high in nitrogen is also needed in the summer to encourage top growth. Do the same thing in the winter, this time, to encourage spring spear growth.